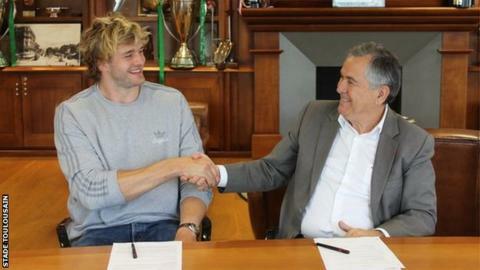 Scotland lock Richie Gray has finalised his move from Castres to four-time European champions Toulouse on a four-year contract from next season. The former Glasgow and Sale second-rower, 26, concluded the deal with Toulouse president Jean-Rene Bouscatel, after it was revealed in November. Gray, who has 56 Scotland caps, still has three matches of the regular season left with near-neighbours Castres. They are three points off the top six play-off positions in the Top 14. The last round is on Saturday, 5 June, with the play-offs starting on 11/12 June, and the final at Barcelona's Nou Camp on 24 June. Gray, along with younger brother Jonny, has been named in the Scotland squad for two Tests in Japan on 18 and 25 June, with the party due to fly out on 11 June.